Being a healthy food blogger, one of my biggest passions is passing on my love for healthy living and healthy eating to my daughter. With toddlers known for being picky eaters, sometimes it can be difficult to get them to try new things (even if you know once they try the food, they’ll enjoy it). One of my favorite healthy food brands to enjoy with my daughter is Dole. Since she can be hesitant to try fruits and vegetables, I love that Dole currently is featuring Beauty and the Beast themed packaging on their fruits, vegetables, and salads. My daughter loves anything Beauty and the Beast, and this wonderful movie packaging is helping her become more willing to try fruits and vegetables. And once she does, she LOVES them! I know I can always rely on Dole produce to be fresh, crispy, and delicious, and now my daughter can enjoy Dole too! We love to snack on Dole pineapple and bananas, but it’s also nice to make creative recipes out of fruit for a healthy and unique breakfast or snack. Dole and Disney have created these incredible Banana and Berry Breakfast Cups! Makes 12 servings, takes 40 minutes. 1. Preheat oven to 350°F. Place cupcake foil liners in the cups of a regular size muffin tin, set aside. 2. Tear bread slices into small pieces; set aside. Whisk almond milk with egg whites, honey and cinnamon; set aside. Fill prepared cups alternating bread, banana slices and berries. Pour in almond milk egg white mixture. 3. Sprinkle granola on top of mixture in muffin cups. Bake 25 to 30 minutes, until firm. Remove and serve warm or at room temperature. 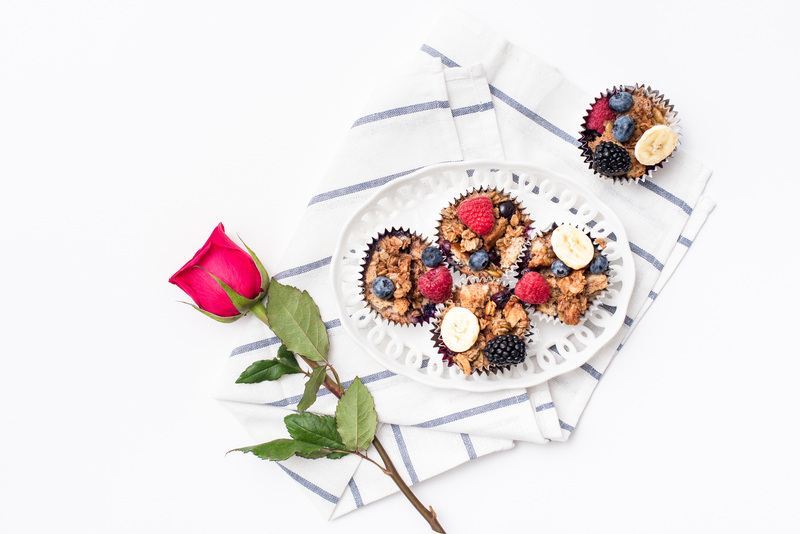 These scrumptious Dole Banana and Berry Breakfast Cups, inspired by Disney’s Beauty and the Beast, are a great way to help your kiddos get servings of fruit and protein whether eating breakfast at home or on-the-go. One (1) Grand Prize: One (1) travel package to the Orlando, Florida, area for winner and up to three (3) guests with roundtrip airfare, 5-day/4-night stay at a resort hotel, four (4) days of theme park tickets and four (4) days/nights of dining plans. Ten (10) Second Prizes: each winner to receive a $50 movie gift card. To take the quiz to participate, visit https://doleliving.com/ . Since I couldn’t be more excited about the Beauty and the Beast packaging on Dole products, I am partnering with Dole to giveaway a beautiful prize to one of my readers! Enter below to win a “Be Our Guest” Patina Vie Porcelain Tray, along with coupons to redeem for Dole fruits and veggies.